Bombardier faces a lengthy legal battle with Boeing after the aerospace giant filed a complaint with the U.S. government and the process could hurt sales of the new CSeries commercial jet, say trade experts and industry analysts. While the outcome of the case is uncertain, they said the Montreal-based company's efforts to sell the plane into the American market could be hampered by the prospect of preliminary duties resulting from Boeing's anti-dumping petition. "Purchasers tend to back away from making commitments until they know the outcome of the proceedings, so I would expect that there will be some form of commercial repercussions," international trade lawyer Lawrence Herman said in an interview from Toronto. Shares of Bombardier fell four per cent to $2.11 in Toronto on Friday following the news. Boeing petitioned the U.S. Department of Commerce and the U.S. International Trade Commission for investigations into subsidies and pricing of the CSeries. 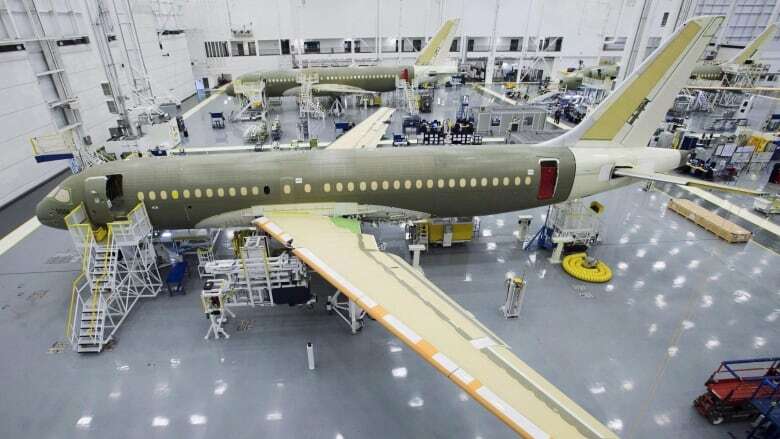 It said more than US$3 billion in government subsidies so far have allowed Bombardier to engage in "predatory pricing" for an aircraft that competes directly against its 737-700 and 737 MAX 7 airplanes. Bombardier and the Canadian government have rejected Boeing's claims. Herman expects the case could drag on for years even though the results of an investigation and imposition of preliminary duties could be known in a few months. Boeing faces a challenge proving its complaints because government funding for the CSeries came in the form of equity rather than traditional subsidies, he said, adding that Boeing has received U.S. government support in the form of research and development grants along with military contracts. Aerospace analyst Richard Aboulafia of the Teal Group called Boeing's legal approach "ill-advised." He said the CSeries has a small impact on Boeing's planes, adding that the argument that the plane was sold well below cost was odd since that's standard industry practice for new planes. "The impact of the CSeries on their product line is incredibly marginal. It's the Delta deal and not much else," he said. Aboulafia also said Boeing could risk an order for its Super Hornet jet fighter by taking on a key sector of the Canadian economy. Herman said Boeing's move could prompt Airbus to take a similar legal action against Bombardier, adding this could stall CSeries sales in Europe. Airbus declined to comment. Brazil has already filed a complaint about the Canadian government's support for Bombardier with the World Trade Organization at the urging of rival manufacturer Embraer. McGill University professor Karl Moore said Boeing is taking advantage of President Donald Trump's approach to trade to take an opportunistic hit at Bombardier, the world's third-largest aerospace manufacturer. "It's just the way the game is played these days," he said from Abu Dhabi. "You rattle your sabre and try to scare customers a bit." By filing a complaint in the Washington instead of Geneva, Boeing could take a quicker toll on Bombardier, said University of Ottawa professor Patrick Leblond. "A little like the softwood lumber file, we could see the imposition of countervailing duties on Bombardier products," he said. Boeing's legal manoeuvre is the latest challenge to Canadian trade with the United States, coming days after the Trump administration criticized Canada's dairy sector and imposed duties on softwood lumber. The U.S. government's protectionist tone could make it tough for other Canadian companies as well, said trade lawyer Alan Wolff. "It's a pro-enforcement administration. That will mean that there's a greater likelihood of these types of cases being filed," he said from Washington, D.C.